December was an active weather month, which resulted in seasonally wet and unusually warm conditions across Washington. Temperatures were above average, especially in southeastern Washington, due to the abnormally mild conditions early in the month that resulted from a strong and mild Pacific air flow that kept conditions well mixed east of the Cascades. 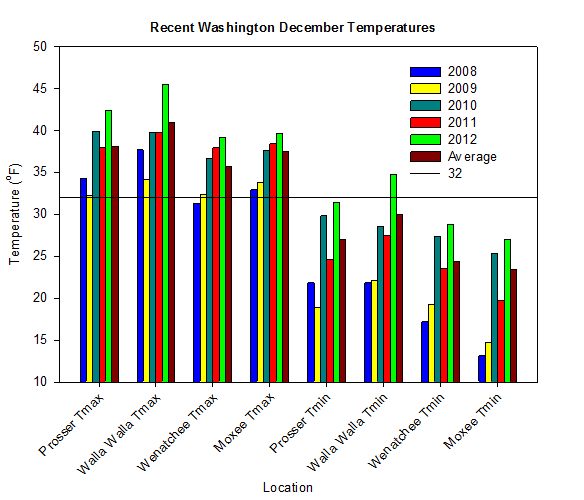 Temperatures at locations such as Walla Walla and Prosser were four to five degrees above average, making December of 2012 the warmest since 1999, and one of the warmest of the last several decades. Evidence of the wet conditions in western Washington comes from Long Beach, which recorded only one dry day (December 30th) during the month. 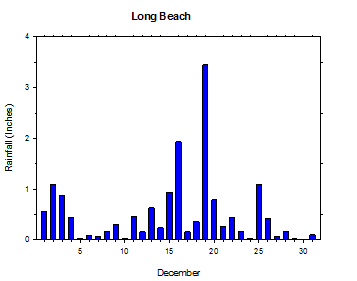 In fact, nearly three and a half inches of rain fell at Long Beach on December 19th alone. Despite early warmth, cooler weather returned later in the month, with many locations in the northern part of eastern Washington experiencing a white Christmas, either from snowfall on Christmas Day or from snow cover left over from previous days. In addition, stormy conditions allowed the Cascade snowpack to climb to above normal levels by the New Year. 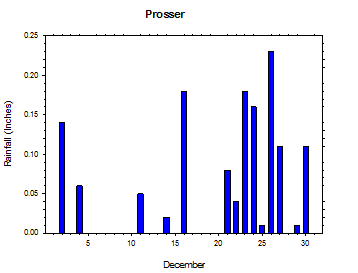 Overall, this December stands in stark contrast to last December, when high pressure dominated for much of the month. 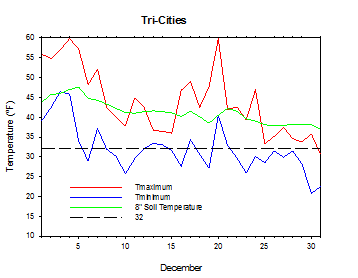 The stagnant and calm conditions led to very dry weather statewide during December 2011, with minimal rain and mountain snowfall. In 2012, however, December featured several periods of seasonally active weather. December began with active and mild conditions under southwesterly flow aloft. A series of storms caused periodic rainfall in western Washington, and warm temperatures in eastern Washington. High temperatures for much of the first week of the month were in the low 60s in parts of south central Washington, with widespread 50s in most areas. 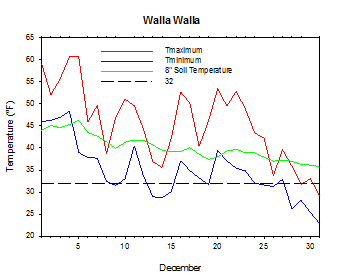 In fact, Walla Walla recorded a high of 61 degrees on December 4th and 5th. 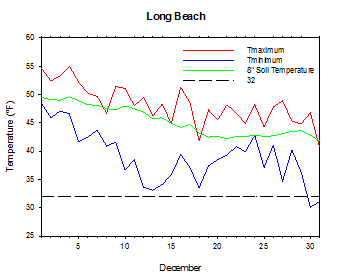 Long Beach received 1.12 inches of rain on December 2nd, and nearly an inch on the following day. A cold front passed through the state on December 5th, as cooler air moved into the region. Moist westerly flow brought several feet of snow to the mountains on December 6th and 7th, along with windy conditions to central and eastern Washington. Cooler and drier air moved in on December 8th under northerly flow, before high pressure slowly moved into Washington on December 9th. However, weak weather systems brushed the region. Temperatures finally dropped below 20 degrees in some parts of northern Washington on December 9th. On December 10th, windy areas experienced well above average temperatures in the 40s and 50s, while many spots in eastern Washington remained under an inversion and recorded highs only in the 30s. Yet another weather system arrived on December 11th. Seasonally cool conditions on December 13th and 14th allowed for snow flurries in parts of central Washington. Highs were in the 30s, and lows were in the 20s east of the Cascades. A series of stronger systems around mid month brought rain, snow, and wind to the region in a more typical December fashion. A moderate strength storm system spawned rain and snow on December 15th. This was followed by a very potent storm late on December 16th, which brought strong winds and heavy precipitation to the region. Significant rain fell in western Washington, while heavy snow and high winds caused blizzard conditions in the mountains. Several inches of snow fell in the northern part of central Washington as well. Winds on December 17th gusted as high as 63 mph at Wenatchee Heights, while Canoe Ridge experienced (15 minute) sustained winds of 46 mph, as the intense low pressure system passed through northern Washington. According to the National Weather Service, winds gusted as high as 100 mph atop Rattlesnake Mountain. Temperatures around the Tri-Cities warmed into the 50s due to the mild southwesterly winds. Meanwhile, the temperature on December 18th fell to 5 degrees at Broadview (Ellensburg), thanks to clear skies, dry air, and fresh snow cover. A cold and unstable air mass on December 18th brought snow showers to parts of western Washington. Additional snow fell along the east slopes of the Cascades from Wenatchee to Omak on December 19th, as another weather system moved into the region. Heavy rain fell near the coast as the front stalled, with 3.45 inches recorded at Long Beach. On the morning of December 20th, strong south winds sustained at 20 to 30 mph continued in southeastern Washington. Morning temperatures were mild in the upper 40s to around 50 degrees in these windy areas, while cool air trapped along the east slopes kept temperatures in the 30s from Yakima to Omak. By afternoon, high temperatures rose into the low 60s in the warm areas around Tri-Cities and Walla Walla. Drier, continental air moved into Washington on Christmas Eve in advance a colder system that brought a White Christmas to many locations across the state. As a ridge of high pressure built into the region after Christmas, somewhat drier conditions prevailed for the rest of the month. 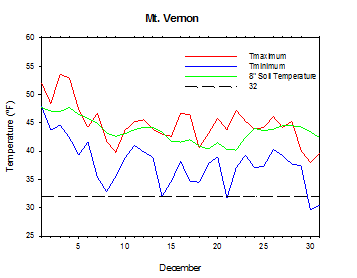 Limited atmospheric mixing and snow cover led to persistently cold temperatures in eastern Washington for the first time in December. However, weak systems continued to bring light rain to the coast and occasional light snow to eastern areas. 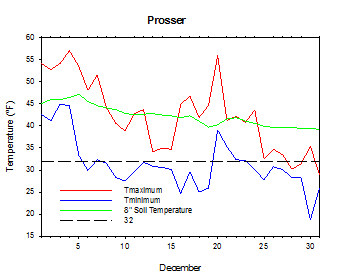 The average December temperature at Prosser (WSU IAREC) was 36.8°F, which is 4.4 degrees (1.2 standard deviations) above average. The average high temperature was 42.4°F, which is 4.3 degrees (1.2 standard deviations) above average. The average low temperature was 31.4°F, which is 4.5 degrees (1.1 standard deviations) above average. The maximum temperature recorded last month was 57.1°F on December 4th, while the coolest daily high was 28.8°F on December 31st. 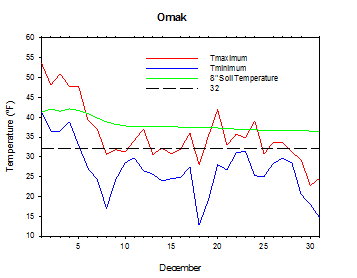 Low temperatures ranged from 45.0°F on December 3rd to 18.7°F on December 30th. Daily average temperatures ranged from 51.9°F on the 4th to 27.5°F on the 31st. The monthly precipitation total was 1.38 inches. 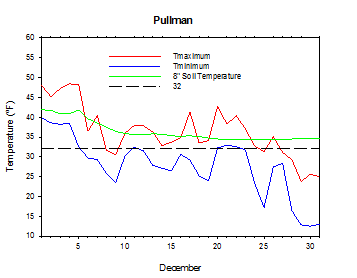 The average wind speed was 4.4 mph, and the average 8 inch soil temperature was 42.3°F. 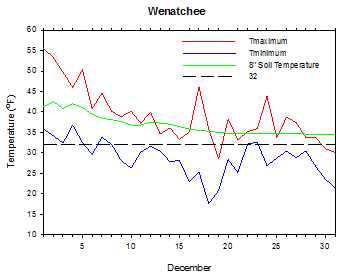 Wenatchee (WSU TFREC) recorded an average temperature of 33.7°F, which is 3.9 degrees above average. December 5th: The high temperature at Walla Walla rose to 61 degrees. December 19th: 3.45 inches of rain fell at Long Beach. 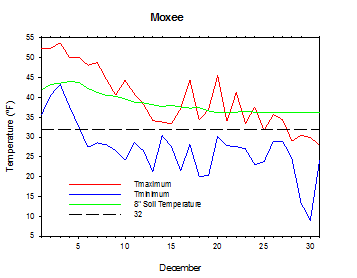 December 30th: The temperature at Moxee dropped to 9 degrees. December was a wet month in western Washington, with standing water on many fields, although no agriculturally adverse weather was reported. The winter wheat crop in eastern Washington generally appeared in good condition. Much needed moisture was received early in the month, while snow cover later in the month provided a protective layer of insulation from cold air temperatures (National Agricultural Statistics Service). 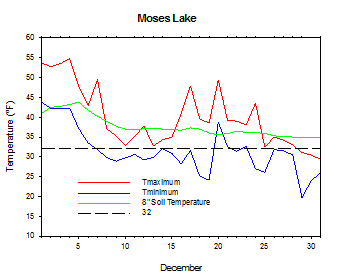 On December 28th, 2011, the low temperature at Prosser (WSU IAREC) fell to only 51.6°F, which is a record warm low for the month of the December. According to the Climate Prediction Center (CPC), near normal temperatures are expected in eastern Washington during January, with slightly enhanced odds for below normal temperatures west of the Cascades. Overall, near normal precipitation is expected. For the remainder of winter and early spring, normal conditions are generally expected. There are slightly enhanced odds for cooler than normal temperatures by mid to late spring. ENSO Neutral conditions are expected to continue well into 2013.